Sayulita is an adventurer's paradise. From the intreped world-traveler to the leisurely beach-goer, Sayulita has everything you could ever want in a vacation. 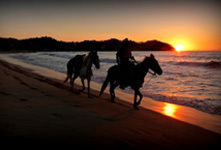 Offering jungle hikes, horseback rides, scuba diving, surfing, canopy tours, yoga and fitness classes, snorkeling, ATV tours, sailboat charters, golfing, professional fishing charters, massages, spas, retreats, and workshops; Sayulita offers activities from adrenaline pumping to sweet relaxation. It is truly a vacation destination that can please every desire. 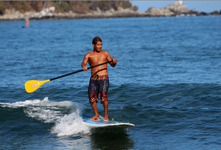 Ocean activities and watersports rule in Sayulita! 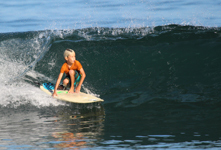 Beginner or pro, surfing at either of the two breaks in front of Sayulita is a thrill, or try the new craze in water sports, Stand Up Paddble Boarding, where you can take a leisurely paddle tour or mix in with the surf crowd and hit the waves. Go fishing for mahi-mahi from an open-bow panga or snorkeling at Sayulita’s Playa Los Muertos, and of course don't forget to go swimming at any of the secret and not-so-secret beaches in and around Sayulita. 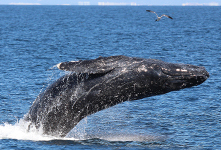 Home to the Humpback Whale! Sayulita boasts an array of fitness activities and sports to enjoy both in and out of the water. Read Sayulita A Real Fountain of Youth. Sayulita is a sports lover's paradise. 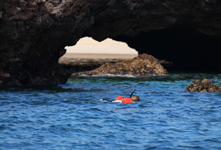 The list of adventure tours and guides in Sayulita guides you to every activity imaginable. Golf enthusiasts will find that Sayulita boasts many golf courses in the surrounding area from begginer to challenging courses. 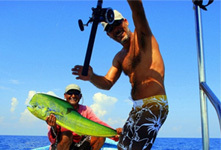 The fishing lover can enjoy sport fishing off of the Sayulita coastline. A favorite activity among many is exploring the underwater sea word while diving or snorkeling off of the Pacific coast. Sayulita surfing is one of the most popular activities due to Sayulita's reputation as a famous surf town. Clean breaks and consistent waves are perfect for beginners and experienced surfers alike. Surfing day trips outside of Sayulita can be arranged to experience some great surf at neighboring beaches along the coast. Check out Sayulita's surf forcast here. After all that activity, if you need some sweet R & R, Sayulita offers soothing massages, day spas, yoga, and a variety of different retreats. And of course, it is hard to beat laying around at the Sayulita beach, sprawled out on a beach chair, reading your favorite new book and enjoying beachside service from one of the Sayulita beachfront restaurants. Experience Sayulita's bohemian, gypset style! A more relaxed day can be spent meandering around the village shopping for fine handcrafted jewelry, art, and clothing from all over Mexico and even from other countries around the world. There are a few famous art galleries around Sayulita, so grab a drink and go on your own gallery hop! There are a variety of bohemian boutiques in Sayulita that offer beautiful and unique items. On Sundays, Sayulita hosts a small street fair with tents and stalls lining one of the town’s cobblestone streets allowing vendors to temporarily display their local handicrafts, clothing, and homecooked food.